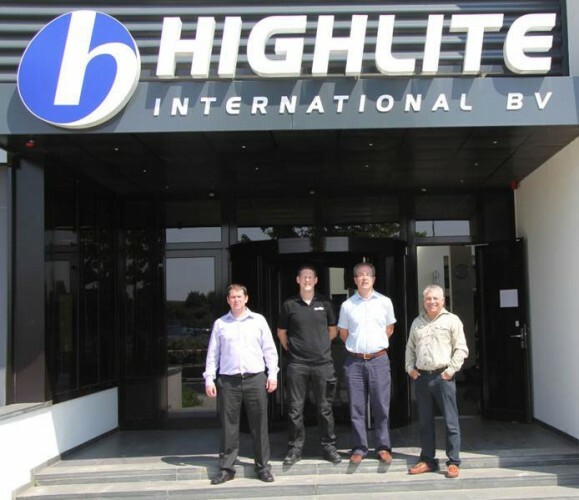 Key Staff from The Saville Group recently took time out from their busy schedule to visit Highlite International HQ in The Netherlands for a full-scale video screen demonstration. Although in the middle of a substantial expansion process at Highlite’s head office, Highlite Staff took the opportunity to show the Saville team around the vast operation. After subsequent evaluations of various screen suppliers, The Saville Group chose the DMT P12.5 Pixel Mesh for quality, reliability and support from Highlite International. The purchase included 60 Panels P12.5 Mesh, plus associated rigging, processing and software. Training was at The Reebok Stadium in Bolton (home of Bolton Wanderers). It involved selected staff from all The Saville Groups’ UK branches, and was conducted by Eric Piefer, Highlite’s video “guru”. The Saville Group is a well-respected supplier of AV and digital solutions to the conference and live event Industry, and also to the education sector in the UK. “Highlite as a company look forward to offering continued supply and support for their multiple operations,” said Malcolm Burlow, director of Highlite UK. In picture: outside the Highlite International HQ in Kerkrade are Darren Christmas, Richard McCartney and Andrew Ellerby of the Saville Group with Dave Hartley, sales manager Highlite UK.